You may have read Ted Eisele's June 22 Guest Opinion that advocated for the removal of the four dams on the lower Snake River as the best way to bring back sockeye salmon to Idaho. It appears his goal is to bring back sockeye in an effort to increase Idaho tourism -- tourists can visit Idaho to catch the sockeye. Overfishing beginning in the late 1800s, as well as mining, logging, agriculture and dams have led to the decline in fish populations. A combination of factors contributed to their decline. And it is a combination of factors that is contributing to their return, including hatcheries, enhanced habitat and favorable ocean conditions. Large-scale structural and operational changes have been made to ensure safe fish passage at these dams -- to further improve fish passage routes and provide new safe passage structures. Recent fish returns demonstrate these changes have resulted in salmon surviving at the dams at levels seen in undammed rivers -- 97 percent on average. Eisele's piece omitted the significance of these dams as a source of carbon-free renewable energy. A key benefit of the dams is clean air. According to the Northwest Power and Conservation Council, without the Snake River dams, 3.0 to 4.5 million tons of CO2 would be added into the air every year. Additionally, the dams are an exceptionally valuable resource in the integration of renewable wind energy. Because wind is variable, it must be complemented with other generation that can be increased when the wind dies down or decreased when the wind blows harder. Hydro generation can quickly respond to the variability of the wind. The article downplays the significance of the dams to inland navigation and power generation. According to the Army Corps of Engineers, about 9 million tons of cargo worth $3 billion transit annually through locks on the Snake-Columbia inland navigation system, including about 40 percent of the nation's wheat. The ability to move cargo via the inland navigation system reduces high carbon emissions from trucks and trains. 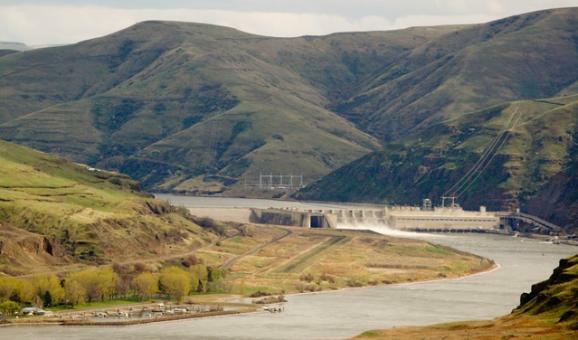 The Bonneville Power Administration records the average annual generation of the four lower Snake River dams over the past 80 years at 1,000 megawatts. That's enough energy to provide electricity to over 800,000 homes -- more than the population of the city of Seattle. Additionally, the dams provide over 3,000 megawatts of critical peaking capability to meet peak winter loads. The four lower Snake River dams play an important role in powering the Northwest. Only a comprehensive approach to salmon recovery that addresses all factors affecting salmon, including habitat degradation, hatchery impacts, and overharvest of returning adults can put salmon on the path to recover. Recovery of salmon will not be achieved with a myopic goal of dam removal. Jo Elg is the general manager of United Electric Co-op, Inc. in Heyburn, and has been in the electric utility industry for over 25 years.